The wonderful Maya Angelou put it simply. This sentiment is embodied by Keziah Gibbons, Master NLP Practitioner, Reiki Master and teacher, and associate of Your Business in Mind, and we are proud to name her in our gallery of success for 2017. Keziah is creator of Vibrant Self Healing, offering integrated coaching, healing and change work, through a variety of complementary media. Some of you will have already met her through the work she has done with us delivering PIE training and in supporting the creation of our Masters NLP course, both administratively and in delivery. She did her NLP Practitioner some four years ago, going on to do her Master Practitioner a year later. She flew with her learning, aligning it to the other skills over which she has mastery. I knew she was good, extremely good, yet, like our delegates, last year I was simply blown away. It began with noting her generosity. Keziah is one of those people with a rare blend of self confidence in her abilities yet true compassion in her nature. Before working with us on PIE, I knew that she had begun to give away free materials on her website. Then a step beyond, she created particular materials to give proceeds to charities. Then when she made bespoke materials for our course, their depth and richness was a true gift. Then the Masters NLP. Modelling is a key component of NLP mastery, so, when invited to join the team last year, congruent as ever, Keziah embarked on a modelling project of her own. She modelled storytelling, an activity close to her heart and soul. When she presented the model on our course, the impact was huge. First, our delegates were impressed and reassured by Keziah’s particular style. As well as being eloquent and elegant in delivery, her manner of pausing is unique and memorable – and everyone buzzed with learning from this. Second, she set an anchor and an opening for all of our group to deliver their stories with open hearts and minds, engendering a level of creativity I have rarely seen within the time frame. On the following day, she created deep shift with a creative blend of NLP, Druidic chanting, Reiki drumming and bringing in Tarot as a means of self consultation. For me, Kez embodies the principles of NLP, along with her other daily practices, in her level of self application. In her own words, ‘The difference in my healing practice is that I have successfully applied each and every intervention on myself’. Kez’s personal journey and learning has been rich with adventure and deep challenge, while she has cultivated her range of applied learning over a seven year period while being a parent and living in several different cultures. 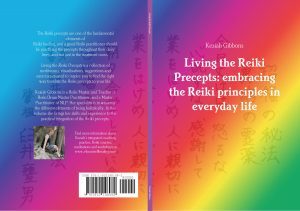 I think that’s what gives her the quiet authority which she tells us that she strives for, in the opening to her book, Living the Reiki Precepts. Perhaps also the boldness to meld many different ways of working to bring something unique and powerful to the party. I am proud of Keziah, and enriched by working alongside her. As some of you know, she is my daughter as well as an associate. I am fortunate that she is a daughter from whom I learn as well as being a woman that I love. When Keziah learns, she teaches, and when she gets, she gives. Our delegates this year on our Masters gave her many accolades, the common theme being that ‘I have tried to make this change/learn this approach before, and couldn’t. With you, I did’. By request, I believe that Keziah is planning a deep shift retreat in the Algarve in 2017, so what better way to start the year than by giving it our full support and wishing you all success in the way that you want it.